#12Days of Color Grande Finale! Well, peeps, I have chosen the winners and I am sending out emails right now. As soon as I get mailing addresses from everyone I will make the final announcements of the winners here on the blog. So be hopeful and look for an email with the heading #12daysofcolor (or something like that!) in your inbox. I will wait a couple of days to hear back from everyone, so please email me back asap, so I don’t go onto the runner-up for your prize! I was going to draw names on Jan 1st, but it took me most of that day to get Motivated to De-Christmastize the house and then a few more days to really finish that process up! And I will have the list up of the winners, but you should know by the time the post goes up who is a winner. Lots more to come this month, so stay tuned! They look great. Thank you for the email telling me I’m one of your lucky prize winners. proud winner here too! The grunge turned out the best in the photos. But, the true colors leave a lot to play with for sashings and borders. And, I always love kona fabrics. And, that horse in the Michael Miller is still my favorite. You have done a lot of work and it has been fun following along and seeing all your work. Wow! The blocks really look wonderful together. 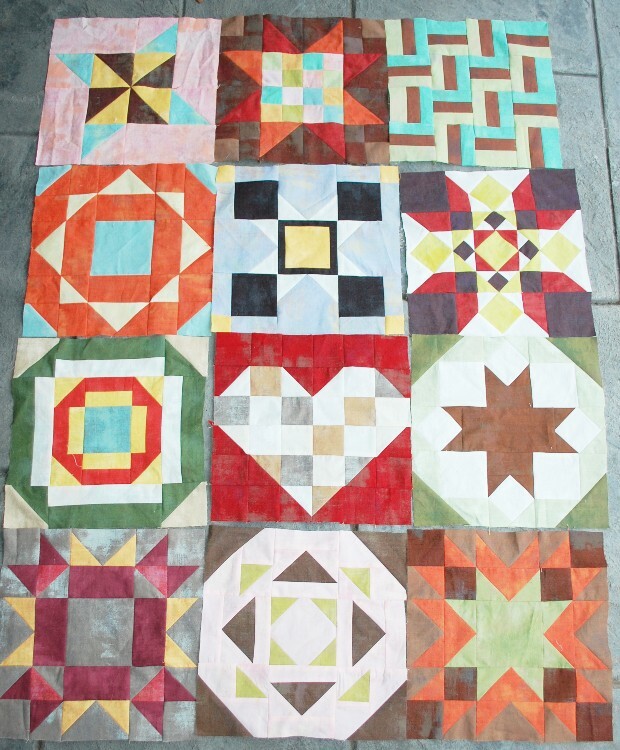 The True Colors quilt is my favorite! It is amazing that I wasn’t really please by the individual blocks but the end composition is beautiful! Thank you for sharing your knowledge of Color with all of us. It was great fun! 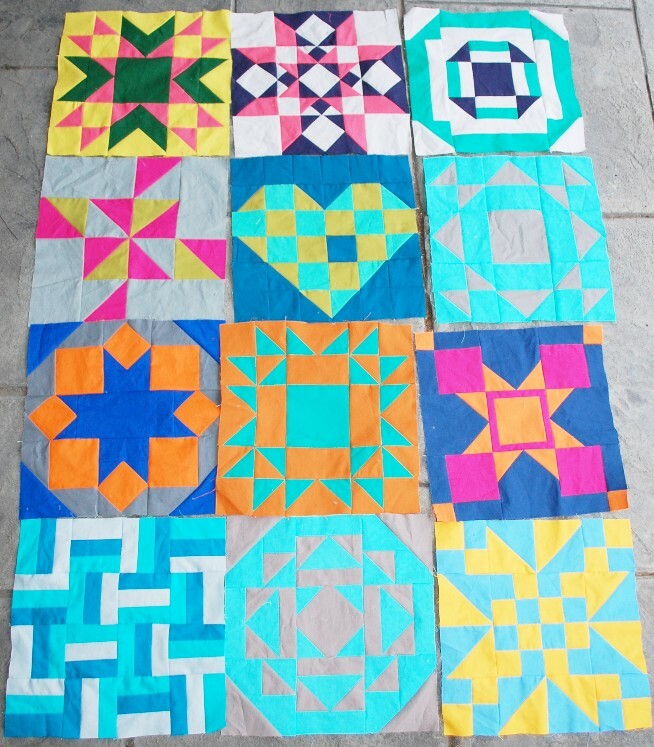 Maybe a Blog Hop of Color for next year? Great recap!! Thanks again for doing this, and thanks to your great prize sponsors! I love how the Michael Miller blocks look together. Thank you for hosting this series -it was fun and probably very time consuming for you. Still loving Grunge all the way!! This was really fun – thanks for doing it! They all look amazing. Thanks for taking the time to show us each set of blocks laid out together. I also was lucky enough to get one of your e-mails and it made my day. Thanks for the email! 🙂 It’s great to see all the blocks. Laid out in their groups like that. I think I prefer the Grunge group now they’re all together. They are absolutely beautiful.Congrats to the winners! I love the true color blocks all together. I was one of the lucky winners and again thank you. Thanks for posting those blocks all together. It’s one thing to view each block on it’s own, but they take on a whole different impact when combined with it’s siblings. Thanks for an email 🙂 and for posting the block ‘families’. I must admit your blocks have convinced me to try the grunge fabrics. there is a subtlety about the colour intensity changing that I really like in the blocks. Can I say I’m surprised how good the blocks look together? Which is another great lesson about colour – how well colours can play together if you let them! 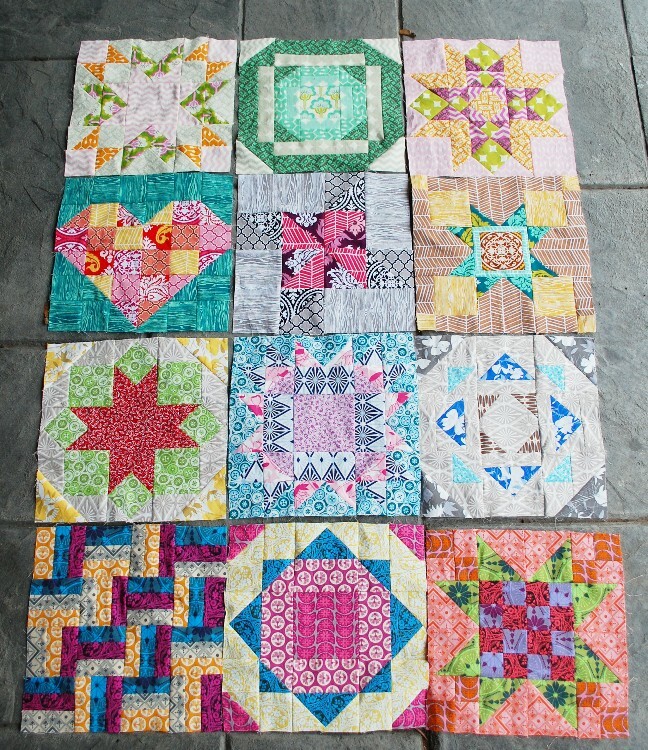 I love them all i would love to see them mixed and matched in one fun quilt ! 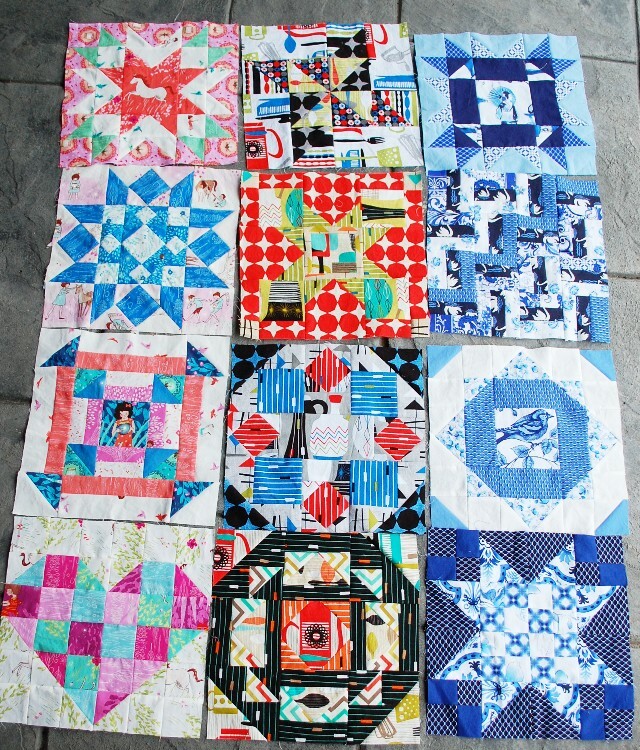 I love them all i would love to see them mixed and matched in one fun quilt ! Thank you for taking the time to make all of these blocks really makes it easier to understand the fun of colors! Hi Scott, Sorry for the rain. I like the true colors best. I know, I need to think outside the box. Thanks for the winnermail! I just love seeing these all together like this! You put so much work into these blocks and the posts, it really gave us all a lot to learn from. I’m not sure if I could pick my fave, but I’m leaning toward the Ture Colors, and the Grunge, sigh…..and the others too. Nope, they ALL are fabulous, and a great reference.